Newcastle Clinic accepts NHS referrals for obese patients requiring an MRI scan. Obese patients cannot fit comfortably in a standard MRI scanner, which has an enclosed tube of only 60cm. Wide MRI scanners, often referred to as wide bore MRIs, have a slightly larger opening of 72cm on average, but still don’t offer enough space for obese patients. These are also only available in a few hospitals in the UK. Newcastle Clinic’s open MRI scanner for obese patients is much larger and has no enclosed tube, allowing overweight or obese patients much more space. The open MRI does not confine patients and is more than double the width of a traditional MRI scanner with an opening of 132cm. Open MRI also provides a more relaxing experience for patients and is much quieter than other MRI scanners. Newcastle Clinic offers obese MRI scans for the brain, cervical or lumber spine, abdomen, hips, shoulders, legs and arms. Obese patients requiring an open MRI scan should request a referral from their GP. We can accept NHS referrals from anywhere in the UK, and patients should note that Newcastle Clinic offers the only open MRI in the North East of England, Scotland or Cumbria. 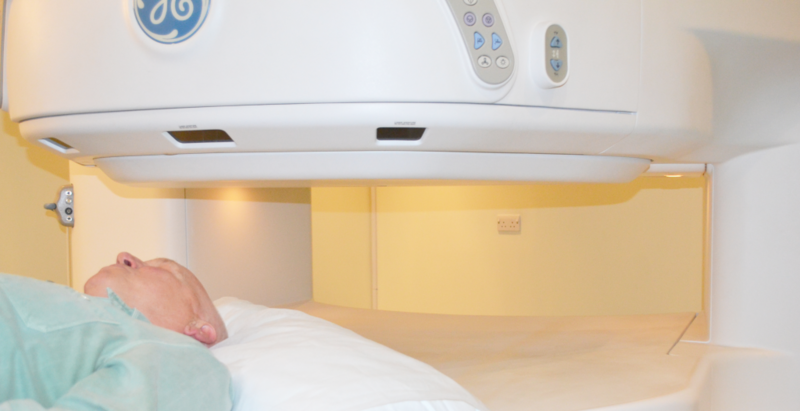 As a private clinic, we can offer you an appointment within one week of instruction and will provide clear diagnostic imaging results within one week of the MRI scan. During the scan, a family member or friend can stay with you to provide additional comfort and help distract you throughout the procedure. An MRI scan takes an average of 45 minutes. Get in touch to discuss the referral process or to learn more about the open MRI. Either contact us via the form below, using LiveChat or by ringing 0191 281 2636.